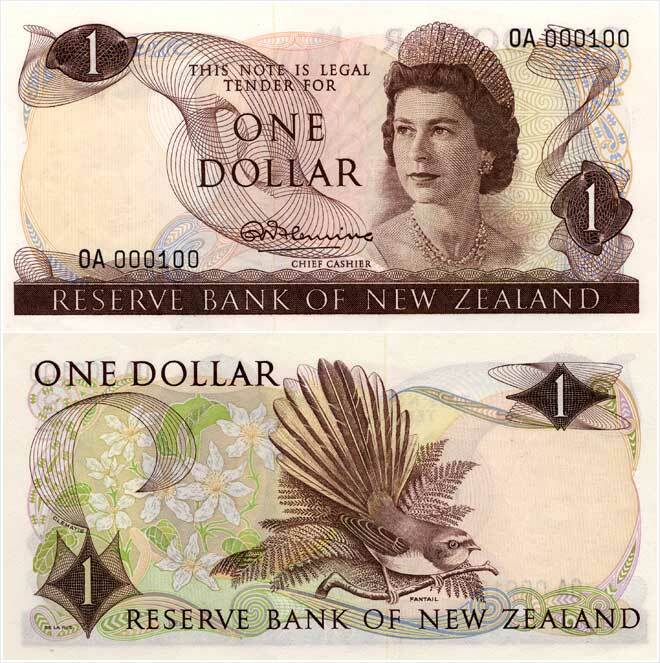 The new $1, $2, $5, $10, $20 and $100 banknotes were designed by a New Zealand committee in consultation with London banknote printers Thomas De La Rue, and were issued in 1967. They all featured the same design on the obverse side, the main elements being a portrait of Queen Elizabeth II – the first time the British monarch had appeared on New Zealand banknotes – and a watermark panel depicting Captain James Cook. The Queen's portrait was based on a 1960 photograph by Anthony Buckley. Each note had a unique design on the reverse side and was distinguished by size and colour, as well as by denomination. The new notes were smaller than previous notes. The frame-like borders of earlier notes were dispensed with to make the new notes appear more modern, and the '$' symbol was omitted to simplify the design. Complicated Māori and European geometric patterns on both sides – and varying from note to note – were intended to lessen the chance of forgeries. A plastic security thread was embedded in the paper. However, counterfeiting was rare until colour photocopiers became more readily available in the mid-1990s. The third-series $1 is brown. The denomination appears in numerals and in words in the centre of the obverse side and the top left of the reverse. The reverse side features a fantail and the New Zealand clematis. 'Reserve Bank of New Zealand' is printed on the bottom of both sides.